One of the most controversial documents in the New Testament among modern scholarship today, 1 Timothy has been under close scrutiny from a literary and content perspective. From claims that the historic Paul did not author the letter, to the most pointed views that 1 Timothy is a misogynistic affront to women, there is no lack of excitement surrounding this ancient document. Incorporating the most recent advancements in New Testament scholarship, Jeon examines the letter from the perspective of its first-century audience. With meticulous precision, Jeon explains the rhetorical use of chiasms in the letter as the deliberate structuring device for its oral performance in the first century. Even more, Jeon shows how the use of chiasms in 1 Timothy impact its audience, shaping and informing their comprehension of the content and their intended response by the author. In refreshing fashion, Jeon's analysis invites and enables a modern audience in the twenty-first century to inch closer to hearing the performance of 1 Timothy and experiencing the author's presence from nearly two thousand years ago. ""The second volume continues to provide a bountiful resource for reading 1 Timothy. Jeon unpacks rich theological insights through careful grammatical and lexical analysis which underscore the rhetorical structure and goals of 1 Timothy 3-4. 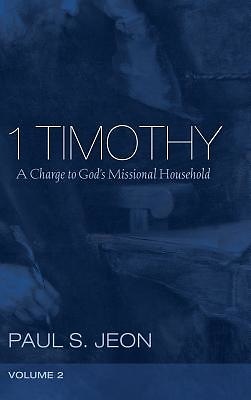 Regardless of one's view on the letter's authenticity, Jeon's analysis provides ample material for pastors and students of 1 Timothy to engage anew the challenges early Christians found as members of God's household."" --Timothy Milinovich, Associate Professor of Theology, Director of Catholic Studies, Dominican University Paul S. Jeon (PhD, Catholic University of America) is visiting professor of New Testament at Reformed Theological Seminary (DC), an ordained elder in the Presbyterian Church in America, and lead pastor of NewCity Church. He is also the author of several books.